October 12, 2018 7:05 pm. 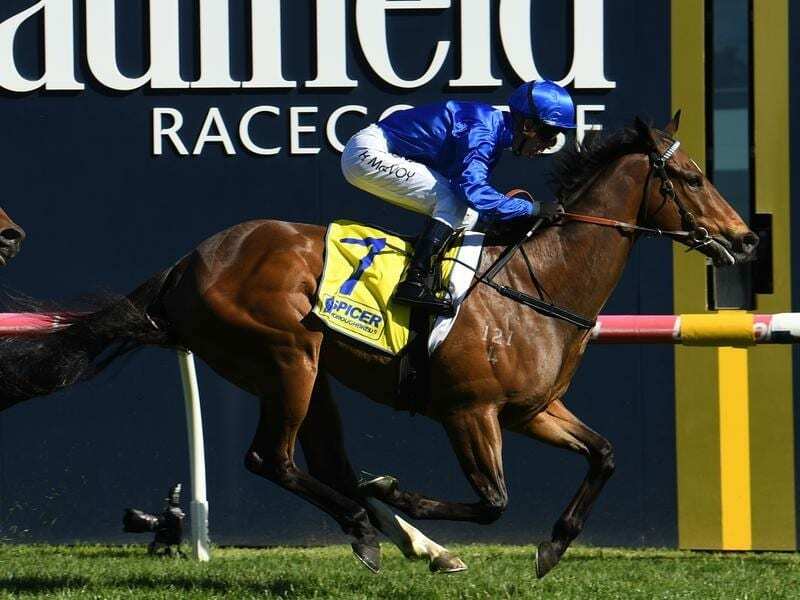 In-form Godolphin sprinter Trekking has won the Listed Testa Rossa Stakes at Caulfield. Godolphin sprinter Trekking has continued his rise through the ranks to claim a stakes race at Caulfield. Trekking took out Sunday’s Listed Testa Rossa Stakes (1200m) after racing in Sydney at the start of his preparation. After notching two wins and a second from three starts, trainer James Cummings elected to switch the four-year-old to Melbourne. Ridden by Kerrin McEvoy, Trekking was heavily-backed from $3.30 to run the $3 favourite and held off a determined challenge by Japanese import Kemono ($5) to win by 1-1/4 lengths. Heart Of A Lion ($81) flashed home for third, a half-length away. “That was impressive. It’s good to see my horses draw a nice barrier and get a nice run,” Cummings said. “He’s obviously made huge leaps and bounds this campaign but I’ll be careful about being too ambitious while he’s able to keep going through his grades.